About 12,000 years ago, the world's climate warmed up, ending the last Ice Age. As a result, the big-game animals that the Paleo- Indians lived on died out around 10,500 years ago, forcing the People to change the way they made their living. This was the beginning of the Archaic Period, which lasted about 7,000 years. Many Archaic Period sites have been found in Nashville. The change in climate allowed forests to grow in many areas, including Tennessee. 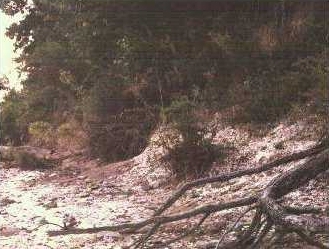 Smaller game animals such as bear, deer, rabbit, wild turkey, and others thrived in the new environment. Forests also produced edible nuts, fruits, roots, berries, and other plants. The Archaic People hunted these animals and gathered these plants for food. Archaic hunters used a spear-throwing weapon called an atlatl. This was a grooved wooden handle from three to six feet long. A piece of bone or antler formed a hook on one end. To use the atlatl, a hunter would lay a spear on the handle with the blunt end against the hook. Gripping the handle and raising his throwing arm behind his head, he threw the spear by quickly bringing his arm forward, snapping his wrist at the end of the throw to release the spear from the handle. 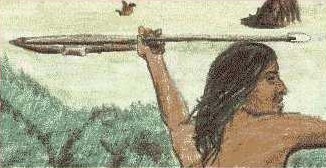 The atlatl had the effect of increasing the length of the hunter's arm, adding force to his throw. The Archaic People lived in small villages of about 15 or 20 houses. They built their houses by cutting small sapling trees of about six inches in diameter, which were then placed upright in the ground in a circular pattern. The trees were bent inward until they met at the top. Covering this framework with woven mats or sheets of bark made a small dome-shaped house. 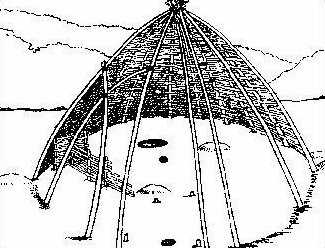 The illustration below is a reconstruction drawing of an Archaic Period house excavated at a site in southern Middle Tennessee. Archaic villages were usually located next to a river or creek. Fish and shellfish harvested from the rivers and streams were an important food source. Many villages were inhabited for long periods, sometimes hundreds of years. The people threw the remains of their shellfish meals onto piles along the river or creek banks. Over the years these mounds of shell could grow to cover several hundred square feet. Several large shell mounds still exist along the Cumberland River in the vicinity of Nashville. The Archaic People made tools out of stone, bone and wood. They made clothing from the hides of animals, and wove plant fibers into baskets, mats, and robes. Most foods were boiled in water-tight baskets. Dropping red-hot rocks in the basket would quickly bring the water to a boil. They also cooked over open fires and in roasting pits. During the later Archaic Period people began making pottery. Long distance trade networks began during the Archaic Period. People in Tennessee traded for copper from the Great Lakes region and large marine shells from the Gulf coast. They used these materials to make beads, pendants and other ornaments.